This photo was taken in, what was then, an old grass tennis court at the back of the school. Back row l to r: Mr. Paget (headmaster); Miss Smith; Robin Jiggins; Unknown; Tony Pritchard; Barry Wilson; Margaret McCaffery; Anne Painton; Heather Taylor; Miss Phoenix; Mrs Phelps. Middle row: Valerie Baker; Neil Rainbird; Richard Westlake; Terry White; Max (or Rex) Holton; Rex (or Max) Holton; Cynthia Cull; Diane Clark; Pauline Moody. This page was added on 02/11/2011. How amazing to come across this website. My family lived on the Great North Road, near the railway station, in the late 50s, early 60s. My sisters and I attended Countess Anne Primary School. Mrs Phelps was my class teacher so it’s wonderful to see her again in the ‘School Leavers 1952’ photo. I remember Valerie Baker and Daved Baker was in my class. 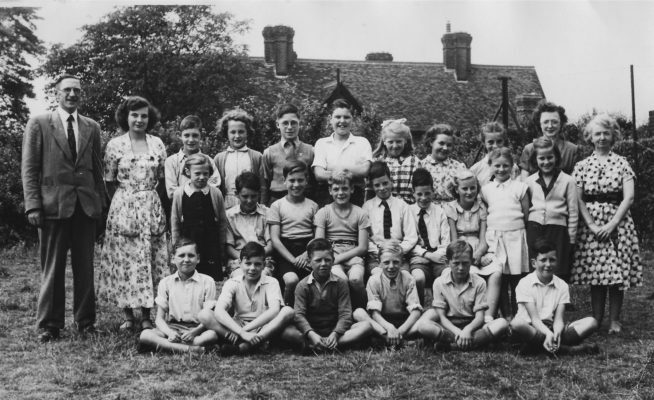 My Family moved to Hatfield in 1948 when I was around 6 years old. We first moved to the Caravan site in front of Hawker Sidney’s Aircraft Office. It was not long after the war and things were very hard. Sadly I don’t have any pictures and I am hope to find some here.